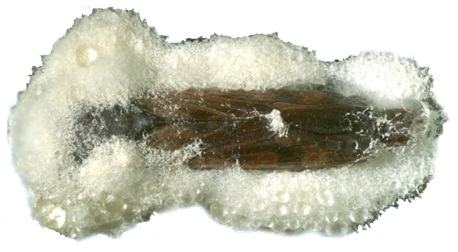 Entomopathogenic fungi such as Beauveria bassiana (commercial formulations, BotaniGard and Mycotrol), Isaria fumosorosea (NoFly and Pfr-97), and Metarhizium brunneum (Met52) are primarily used for controlling arthropod pests. Research in the recent years evaluated their endophytic (colonizing plant tissues) and mycorrhiza-like (associated with roots) relationship with plants and potential benefits in improving plant growth and health. 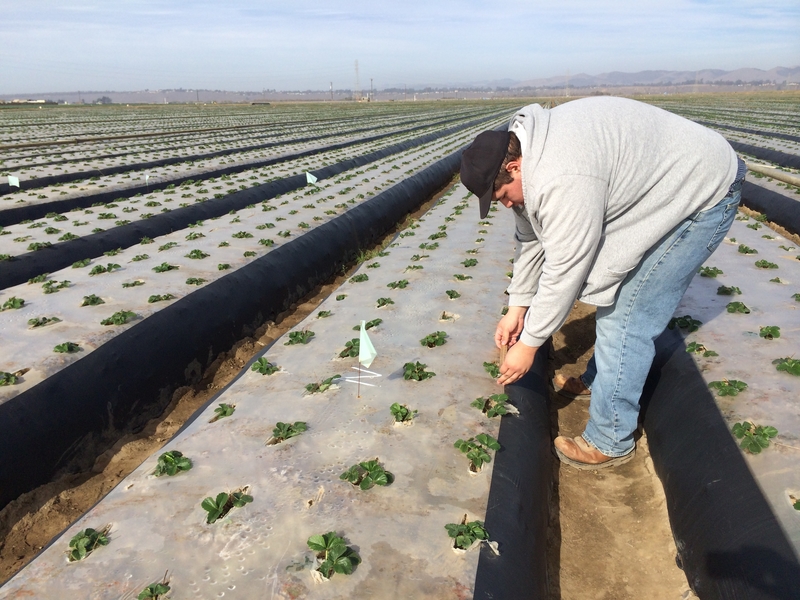 Studies conducted in California showed that B. bassiana endophytically colonized strawberry plants and persisted for up to 9 weeks in various plant tissues (Dara and Dara, 2015a); promoted strawberry plant growth (Dara, 2013); and negatively impacted green peach aphids through endophytic action (Dara, 2016). 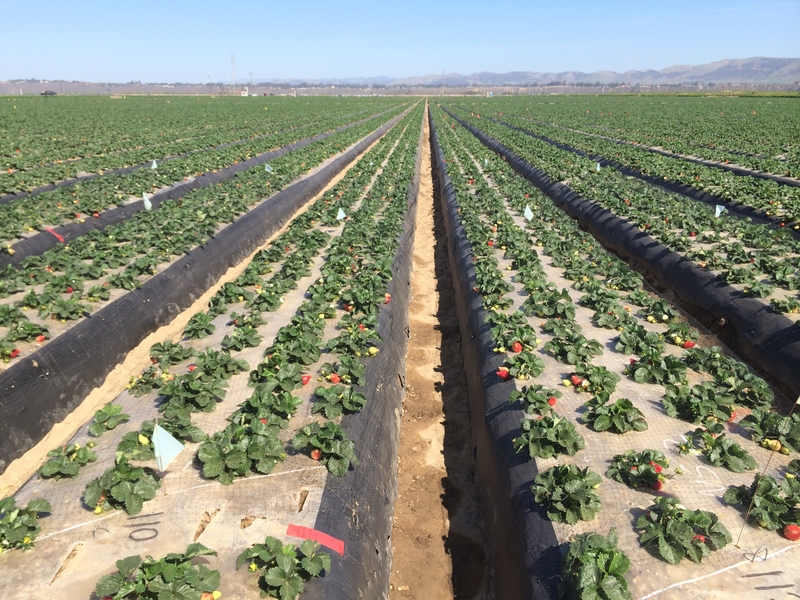 Soil application of M. brunneum appeared to have a positive impact on strawberry plants in withstanding twospotted spider mite infestations (Dara and Dara, 2015b). Similarly, M. anisopliae reduced the salt stress in soybean (Khan et al., 2012) and M. robertsii enhanced root growth and nutrient absorption in switch grass and haricot beans (Behie et al., 2012; Sasan and Bidochka, 2012). In another study, nitrogen obtained from an insect host through infection (entomopathogenic relationship) was transferred by B. bassiana and Metarrhizum spp. 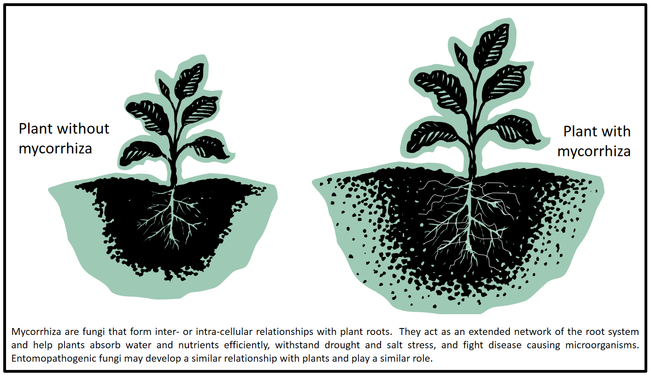 to a plant through an endophytic or mycorrhiza-like relationship. Several beneficial microbe-based products are commercially available to promote plant growth under normal or stressful conditions and to boost plant defenses against pests and diseases. However, several mycorrhizae do not form a symbiotic relationship with several cruciferous hosts and mycorrhizae-based products are typically not used in cole crops. If entomopathogenic fungi, which have a great promise for pest management in IPM programs, could also promote plant growth and health through an endophytic or mycorrhiza-like relationship, they will maximize their potential for multipurpose use in crop protection and production and potentially reduce the cost of applying multiple products for multiple purposes. 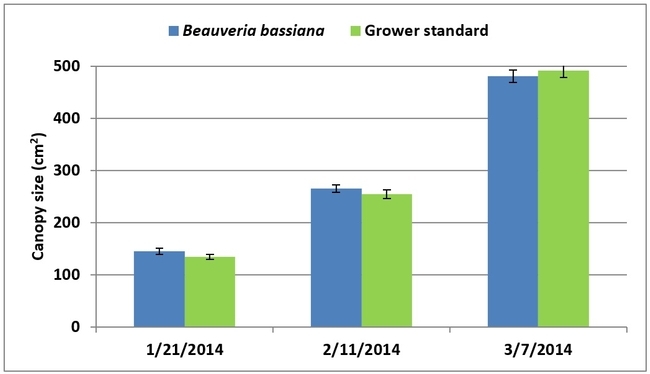 A study was conducted in 2014 to evaluate the impact of B. bassiana, I. fumosorosea, and M. brunneum on potted cabbage plants growing in artificial light with reduced water. About 3-week old cabbage (var. Supreme Vantage) transplants (obtained from Plantel Nurseries, Santa Maria, CA) were planted in Miracle-Gro® Moisture Control Potting Mix (NPKFe 0.21-0.07-0.14-0.10) in 650 ml containers. 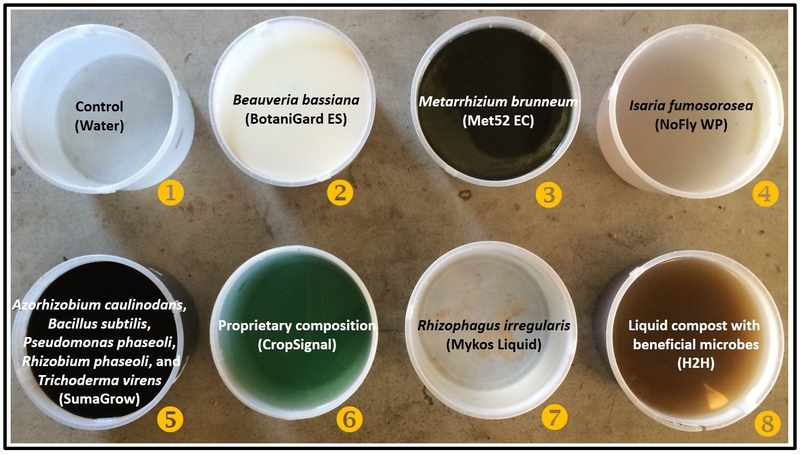 Treatments included BotaniGard ES (1 ml), Met 52 EC (1 ml), NoFly WP (2.5 mg), SumaGrow (2.3 ml), CropSignal (1 ml), Mykos Liquid (0.03 ml), and H2H (10 ml) in 100 ml of water which were added to each container in respective treatments. Miracle-Gro alone was used as the control. Each treatment had 10 plants which were grown under artificial lighting (75 W plant light in each corner). 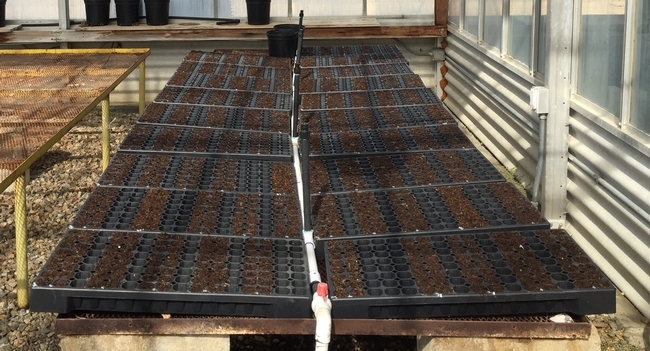 To each container, 50 ml of water was added again on 42, 50, 64, and 81 days after planting. Temperatures during the study were 56o (minimum), 71o (average), and 88o F (maximum). 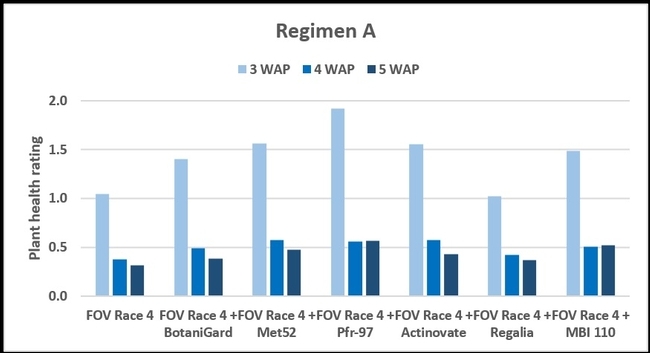 Plant health rating was recorded at 40 and 70 days after planting on a scale of 0 to 5 where 0=dead, 1=weak, 2=moderate-low, 3=moderate-high, 4=good, and 5=very good. 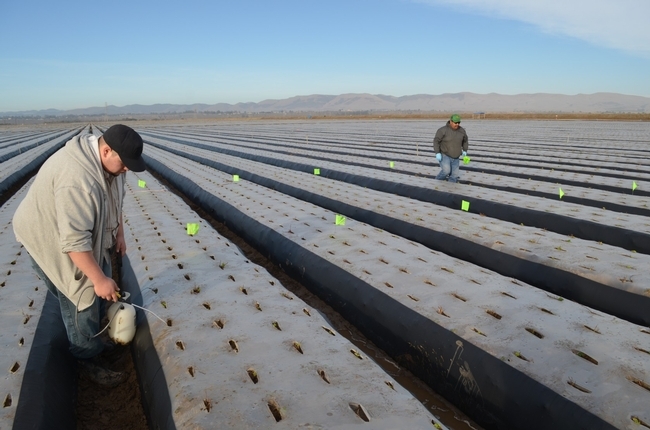 Plant survival was recorded at 40, 70, and 90 days after planting. 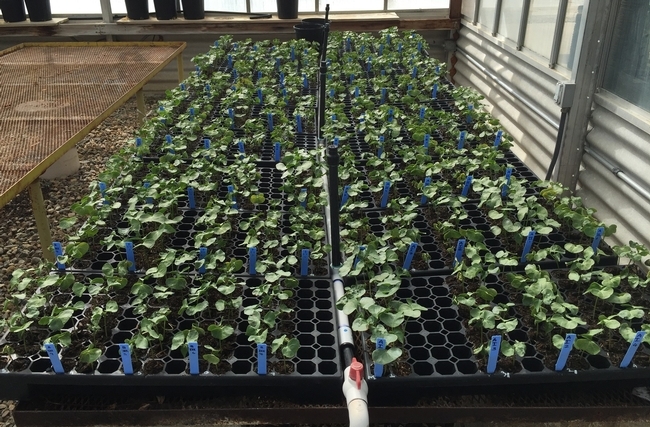 Shoot and root length were recorded at 90 days after planting by unearthing each plant from the containers. 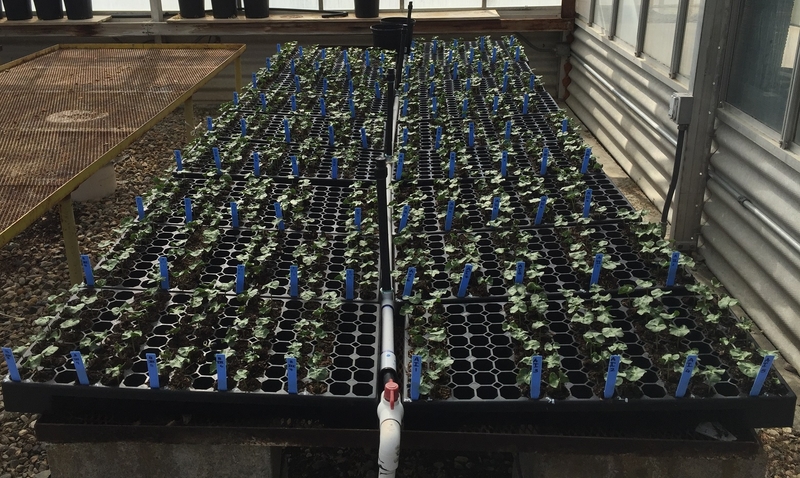 Plants from each treatment were placed in paper bags and dried in an oven at 98oF for 8 days. 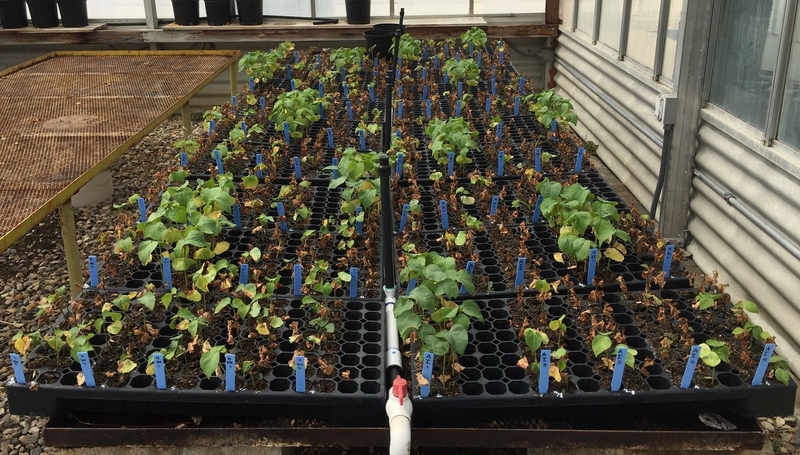 Dry weight (biomass) of the plants was measured before sending them to an analytical lab for nutrient analysis. Data were subjected to analysis of variance and significant means were separated using Least Significant Difference test. 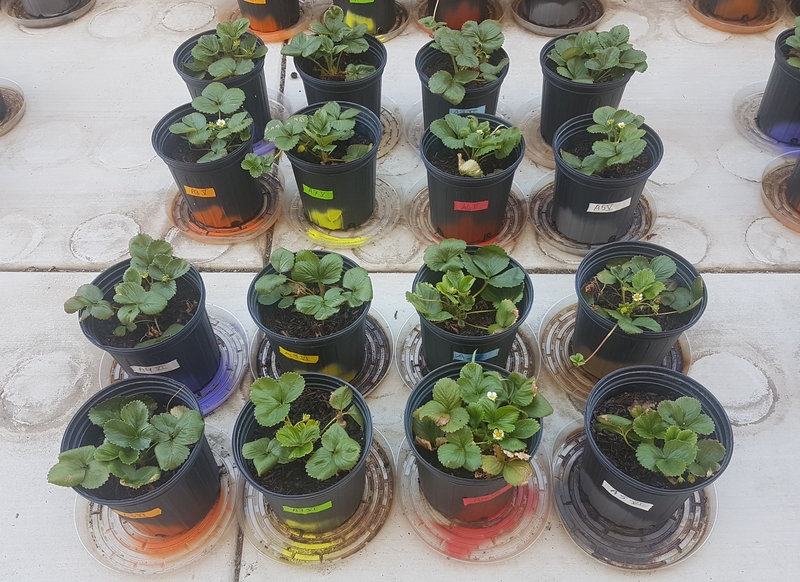 Since some treatments had fewer plants by the end of the study, biomass measurement and nutrient analysis were done together for all the remaining plants and those two parameters were not subjected to statistical analysis. 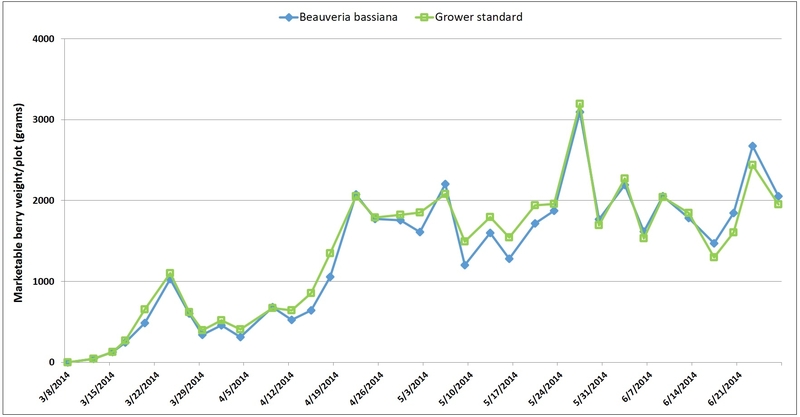 Plant health: Plants treated with B. bassiana were significantly and uniformly healthier (P < 0.00001) than the rest of the treatments on both observation dates with a ‘very good' rating. 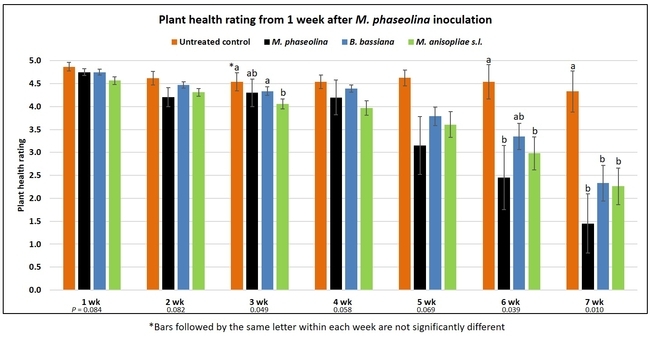 Health of the plants growing in Miracle-Gro with no supplements also had a ‘good' rating and was better than the health of plants in most of the remaining treatments. 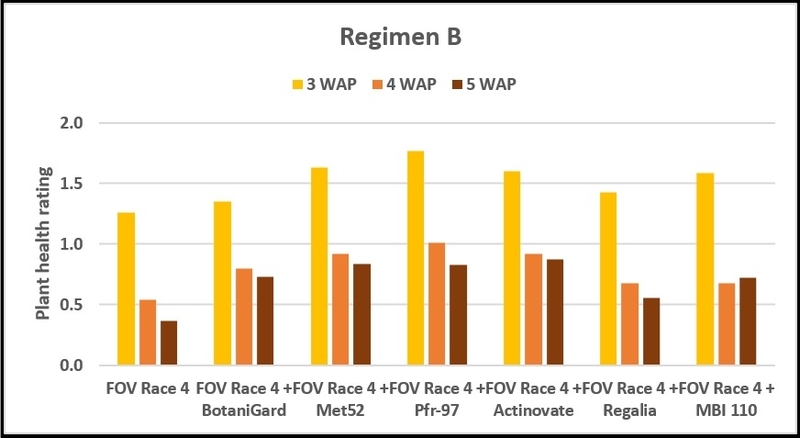 Plants treated with SumaGrow and H2H had poor health with a ‘weak' rating. 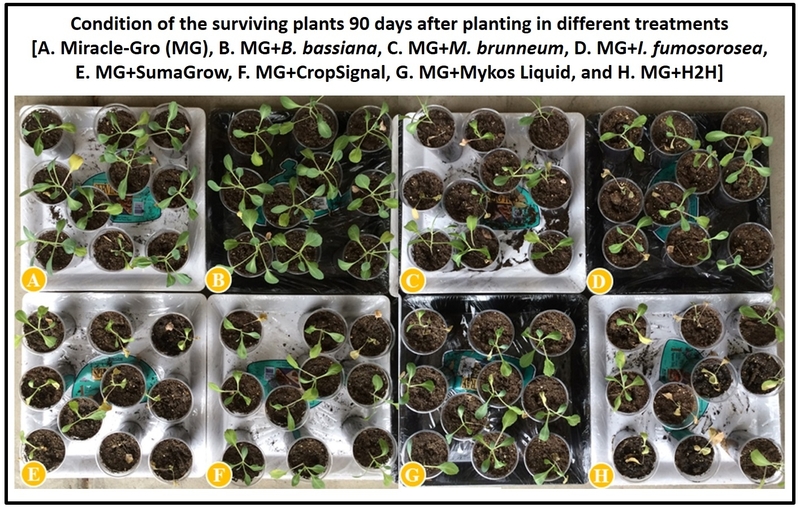 Shoot and root length: Plants treated with B. bassiana and M. brunneum had significantly (P < 0.00001) longer shoots than other treatments. Miracle-Gro-treated plants were shorter than those treated with these two entomopathogenic fungi, but longer than those in the remaining treatments. 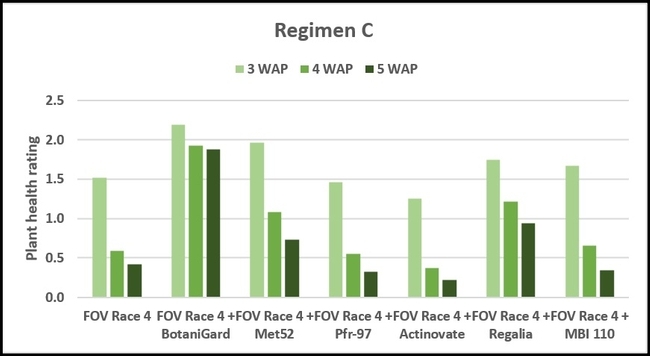 When root growth was compared, plants growing in Miracle-Gro alone and along with Crop Signal had significantly (P < 0.00001) longer roots than the rest. Shoot-to-root ratio: Beauveria bassiana and M. brunneum treatments contributed to a significantly (P < 0.00001) higher ratio than the rest of the treatments. Biomass and nutrient absorption: Plants treated with B. bassiana had relatively higher biomass. When the plant weight as a result of accumulated nutrients was calculated by dividing the weight with respective nutrient content, B. bassiana appeared to have relatively higher output for nitrogen, phosphorus, and potassium based on numerical values. Such an effect for iron was seen in all, except H2H, treatments compared to Miracle-Gro alone. However, these values are only indicative as they were not subjected to statistical analysis. This is the first report of the direct impact of entomopathogenic fungi on cabbage plant growth. 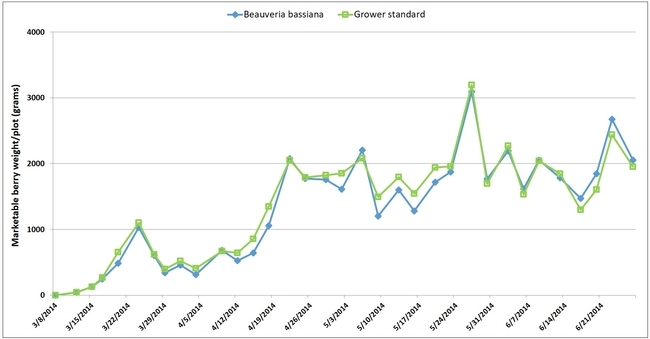 Beauveria bassiana and to some extent M. brunneum had a positive impact on plant growth and health even under reduced water conditions. 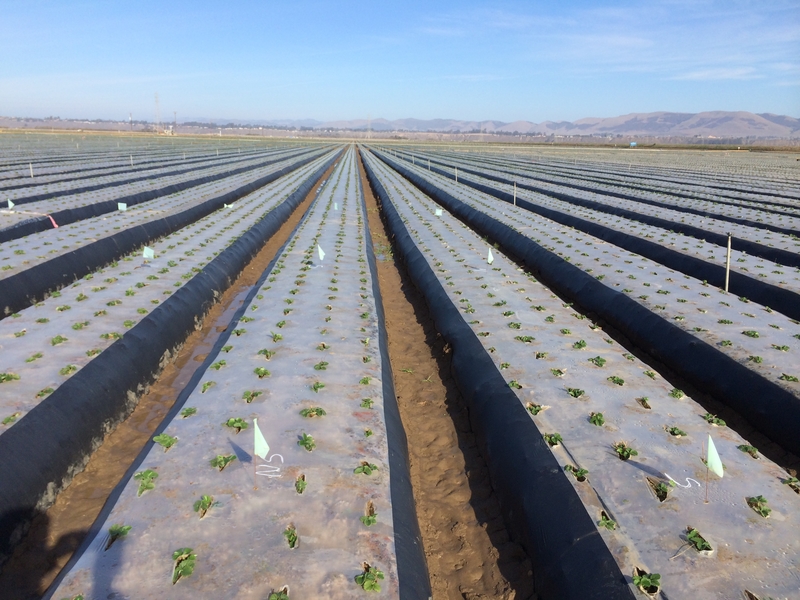 If they could be used to promote plant growth, improve water and nutrient absorption, withstand saline or drought conditions, increase yields in addition to their typical use as biopesticides, then they can play a critical role as holistic tools in sustainable agriculture. Acknowledgements: Thanks to Plantel Nurseries Inc. for donating cabbage transplants, and Advanced Soil Technologies, Bioworks Inc, California Safe Soil, Novozymes Biologicals, Reforestation Technologies International, and SumaGrow USA for various treatment materials used in this study. Behie, S.W., P.M. Zelisko, and M.J. Bidochka. 2012. 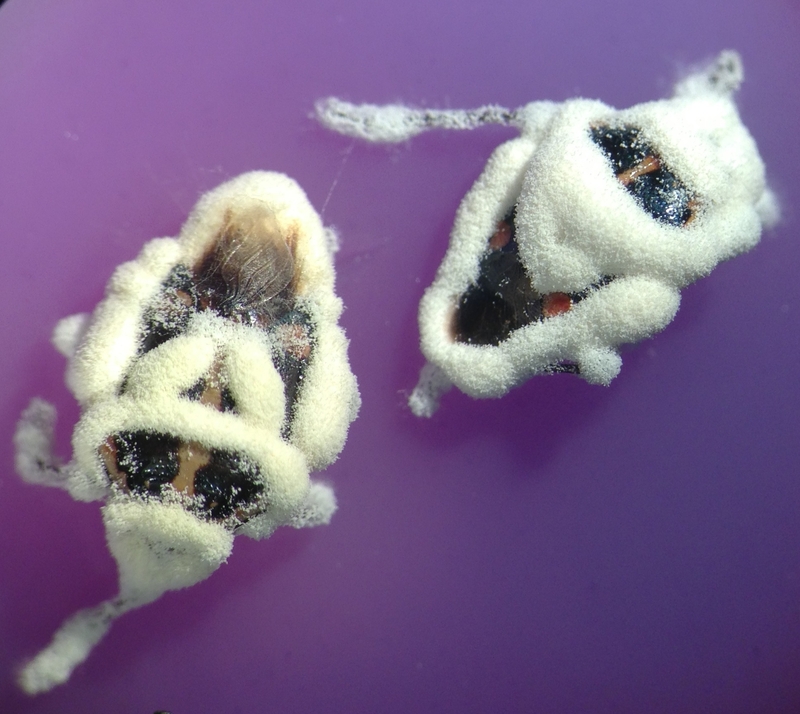 Endophytic insect-parasitic fungi translocate nitrogen directly from insects to plants. Science 336: 1576-1577. Sasan, R.K. and M.J. Bidochka. 2012. The insect-pathogenic fungus Metarhizium robertsii (Clavicipitaceae) is also an endophyte that stimulates plant root development. Amer. J. Bot. 99:101-107. Beauveria bassiana is a naturally occurring fungus that is pathogenic to several groups of arthropods. It is available in different commercial formulations for pest management in agriculture, nurseries, landscape, greenhouse, turf, and home gardens. BotaniGard ES and 22WP are the conventional formulations and Mycotrol-O was the organic-approved formulation, all distributed by BioWorks, Inc. After the OMRI organic certification for Mycotrol-O expired in August, 2015, the Butte, MT based manufacturer, LAM International, changed the formulation with an approved inert ingredient. Mycotrol ESO and Mycotrol WPO are the two new organic-approved formulations of B. bassiana registered for various pests for different situations. Both formulations have WSDA organic certifications. 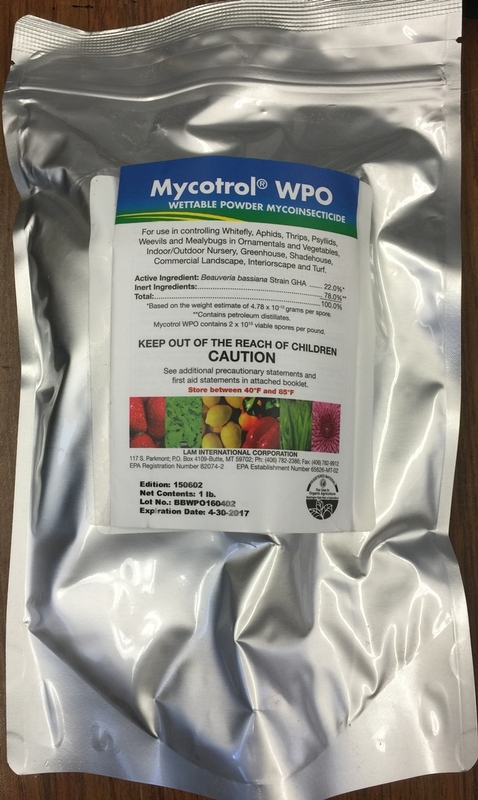 Unlike Mycotrol-O, ESO and WPO formulations have specific crop uses and it is important to verify labels for appropriate use. It is similar to BotaniGard ES except for an organic-approved mineral oil carrier. Mycotrol ESO has a shelf life of 18 months and does not require refrigeration. However, as the product contains a live fungus, it is important to avoid exposure to high temperatures. 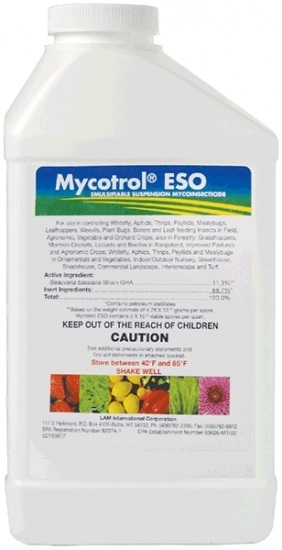 Mycotrol ESO is registered for several agricultural crops and multiple pests except for cranberry girdler. It is a formulation similar to BotaniGard 22WP except for the inert ingredients. It has a shelf life of 12 months, which is shorter than the ESO formulation, but does not require refrigeration. Avoiding storage in warmer conditions is important due to the live fungus in the formulation. Mycotrol WPO is primarily used for greenhouse, nursery, landscape, interior scape, turf, and container soil applications. Although it is registered for many agricultural crops, due to the lack of application instructions, it cannot be used on them. Unlike Mycotrol-O and ESO, WPO formulation has fewer insects on the label and is not registered for certain species of plant bugs, weevils, all stem-boring Lepidoptera, foliage-feeding Lepidoptera, and leaf-feeding beetles. Both ESO and WPO formulations have zero preharvest interval and 4 hours of restricted entry interval. They can be tank-mixed with several other insecticides, miticides, fertilizers, and multiple fungicides. An earlier study with BotaniGard ES showed its compatibility with fungicides Merivon, Microthiol Disperss, Rally, Rovral, and Switch (Dara et al., 2014). However, Captan and Thiram were not compatible with B. bassiana. 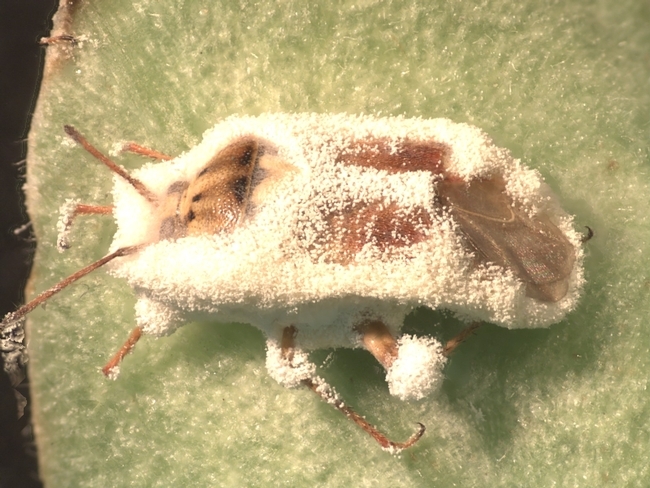 Beauveria bassiana and other entomopathogenic fungi play an important role in IPM. Several studies showed their potential in managing strawberry and vegetable pests (Dara, 2013; 2015a, b, c, d & e). While entomopathogenic fungi can be used as standalone treatment options in several circumstances, by combining and/or rotating with chemical or botanical pesticides, they serve as an important part of the IPM tool kit for multiple crops against multiple pests. Acknowledgment: Thanks to Daniel Peck, Bioworks, Inc. for the information on new Mycotrol formulations.